A new approach to predict the intensity and direction of earthquakes lies in an unlikely source — 10,000-yearold, improbably balanced rocks. You’ve probably seen pictures of these; they are astounding, seemingly impossible and a little scary. You certainly wouldn’t want to be standing downhill if they toppled over. 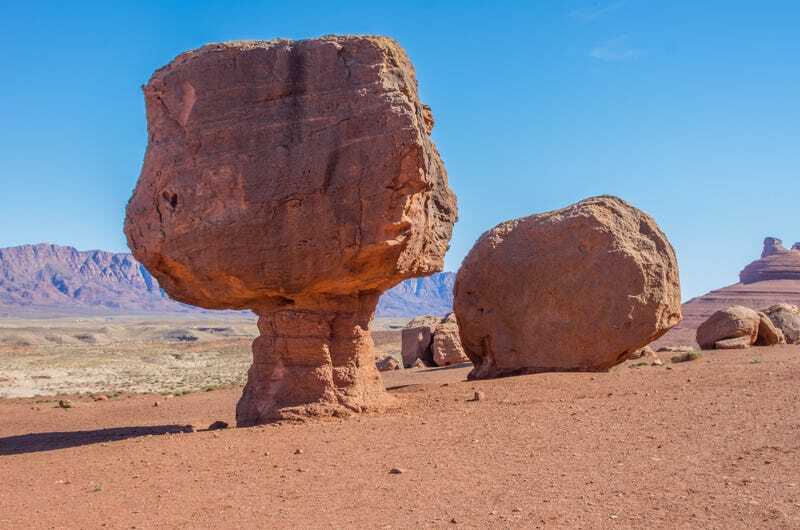 These geological features are called Precariously Balanced Rocks or “PBRs.” They are formed slowly when tectonic forces elevate granite rocks from below ground to the surface, and erosion whittles away the softer surrounding materials leaving the unlikely and amazing result. hat future quakes might do and how to prepare in advance for the inevitable destruction. The researchers propose that around the San Bernardino’s PBRs, earthquakes occur less frequently and with less energy. As a mechanism, they suggest that a quake initiating on the San Jacinto fault could “hop” into the San Andreas fault, giving up some of its energy and diverting the path of the seismic activity. This process would then alter the direction of quake energy and the location of most critical damage; in this case, sparing the PBRs. This likelihood is nice to know when developing plans for structures, water supplies and other support systems in quake-susceptible areas. Alternately, the “hop” might lead to ruptures along both faults simultaneously, multiplying the devastation. Also, very important for planning purposes. Investigate the locations of other PBRs around the globe. Are these in earthquake-prone areas? Research other methods of earthquake prediction. How do they compare with the evaluation of PBRs in susceptible areas? Create a map showing the paths of the San Andreas and San Jacinto faults. What population centers are located within 50 miles of these faults? Like what you read here? Subscribe to Headline Discoveries to get more like this delivered straight to your inbox! This entry was posted in Earth Science, Physics and tagged earthquakes, erosion, Geology, PBRs, precariously balanced rocks on March 3, 2016 by Danielle Ferrante. View our store for all of your science education needs. Have we Discovered How to make Drought-Resistant Crops? Can Phenomenon-Based Learning Help Students?